In Greek Mythology, Apollo was the God of Light, and it was his job to pull the sun across the sky in his 4-horse chariot every day. He has also been referred to as the God of music, poetry, art, medicine, knowledge, plague and archery. Apollo was the son of Zeus (the God of Thunder) and Leto. He had a twin sister, Artemis, who was the Goddess of Hunting. Apollo was also famous for being an oracular god, and had two cults in Delphi and Delos. People would come from all over the world to learn from Apollo what their future held. It was believed that, as the God of both medicine and plague, Apollo could heal people as well as cause disease by shooting people with his arrows. Daphne was a Naiad Nymph in Greek Mythology, and was the daughter of a river god. She was famous for being incredibly beautiful and for catching the eye of Apollo. However, Daphne was determined to remain unmarried and untouched by a man by the rest of her life. Greek Mythology states that Apollo had been mocking the God of Love, Eros (also known as Cupid). In retaliation, Eros fired two arrows: a gold arrow that struck Apollo and made him fall in love with Daphne, and a lead arrow that made Daphne hate Apollo. Under the spell of the arrow, Apollo continued to follow Daphne, but she continued to reject him. Apollo told Daphne that he would love her forever. Daphne turned to the river god, Peneus, and pleaded for him to free her from Apollo. In response, Peneus use metamorphosis to turn Daphne into a laurel tree. Apollo used his powers of eternal youth and immortality to make Daphne’s laurel leaves evergreen. 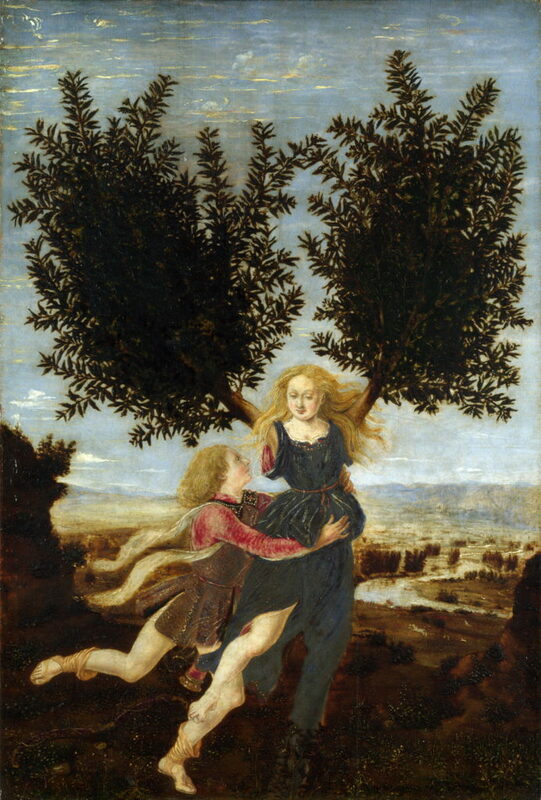 It’s believed that Daphne has to sacrifice her body and turn into a tree as this was the only way she could avoid Apollo’s sexual advances. After Daphne had been transformed into a Laurel, Apollo made the plant sacred and vowed to wear it as clothing. Eros fired the two arrows into Apollo and Daphne because Apollo had been making fun of him. Apollo had recently been victorious and won Python, an earth dragon, and told Eros that his godly talents were useless compared to his own. Eros fired the arrows from the top of Mount Parnassus. In the Greek language, the word for ‘Laurel’ is ‘Daphne’. The Laurel became the symbol of Apollo and the symbol of poetry. Every 4 years, a Laurel wreath would be given to winner of the Pythian Games. These Games were held in honour of Apollo.